She's a nurse. He's a Fireman. They met in the ER. They both save people! And they are an amazing couple. Today Tommy and Christa were married at beautiful Oak Creek Terrace in Sedona, Arizona. And here are their cakes! This is Andrea with her Assistant Cake Artist - the talented Kelsey Fink, after setting up the cakes in the gazebo next to Oak Creek. There is a marzipan "nurse" atop the wedding cake - dressed in a sugar nurse's uniform and a sugar fireman on the chocolate wedding cake adorned with pink sugar calas. It was the perfect symbolism of this magical couple. We wish you the best, Tommy and Christa. I love the fire truck- wow! you did a great job. Christa and Tommy must have been thrilled! Was the fire truck a surprise? Could you post a close-up of the nurse and fireman- I'd love to get a closer look. 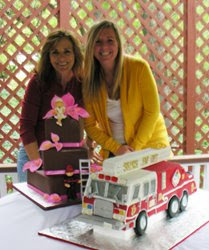 We throughly enjoyed working on the fire truck cake, adding details to personalize it for this wonderful couple. Congratulations Christa and Tommy! 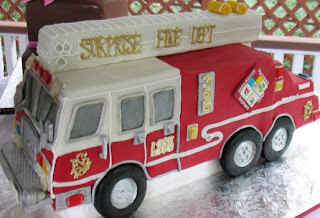 I like your firetruck cake because I saw it on the computer. Its so pretty. It reminds me of a real firetruck. Breanna B. is my soon to be 5 year old grand-daughter. Recently she pulled up my website to show me the cake she wanted for her 6th birthday. I said - but dont you mean your 5th birthday, Breanna? To which she repiled - No, I want an Ariel cake for my 5th birthday - this one is for my 6th! !